Strong Families Blog: Looking for something to do on Mama's Day? 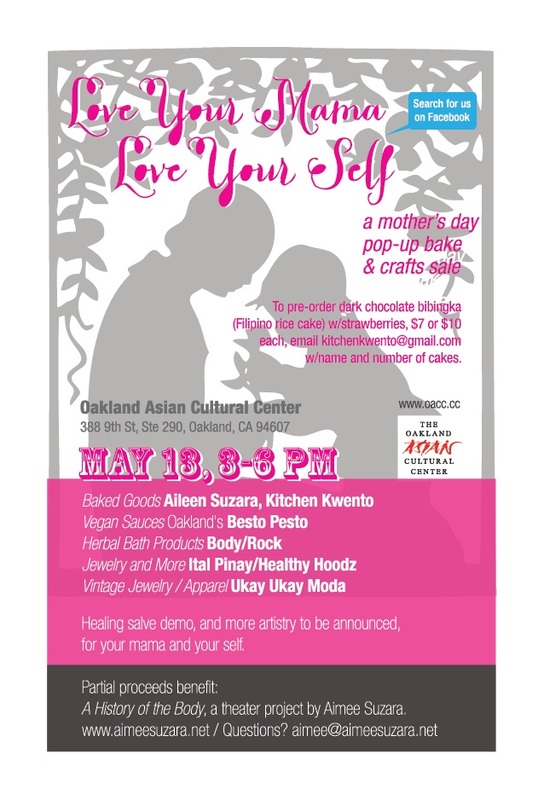 On the afternoon of Mother’s Day, Aimee Suzara will be hosting a Pop-Up Bake and Crafts expo/sale, "Love Your Mama/Love Yourself," at the Oakland Asian Cultural Center and part of its Asian Heritage Month. The event will highlight Filipino-American and independent artisans of color bringing wearable art inspired by the diaspora and ecological designs and materials, healing bath products, and hand-crafted foods. It features healthy vegan pesto sauces by Besto Pesto and dark chocolate bibingka (Filipino rice desserts) from Kitchen Kwento. From 4-4:30, there will be a healing natural salve/lip balm demo by Liza Gesudin, then poetry from 4:30-5 by Malia Connor, Toussaint Stewart, Phuong Nguyen and Aimee Suzara. Throughout the event DJ LN will be spinning music to uplift the soul. The event’s purpose is fourfold: to highlight emerging and independent craftspeople; to provide entertainment and eco-friendly, non-corporate gift options for Mother’s Day; to celebrate mothers and extend the celebration of “mothering” to people of all genders, ages and family role; and to support the project, A History of the Body, which aims to address and bring healing to women around body image and love of self. Mother’s Day is a day to honor the mothers in our lives – those who care, nurture, and sustain our world – as well as the mothering nature within us all. Furthermore, looking to the “mother” means honoring our cultural heritages and the innovations they inspire, as well as “mama” earth. We hope to gather a diverse community of visitors who will leave feeling nourished, mind, body and soul.